Whether it be Communiversity, June Fete, or your school picnic, chances are that no one has made accommodations for recycling. 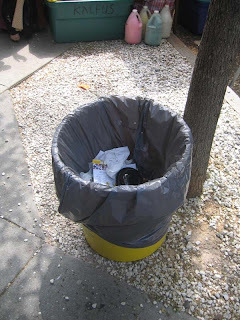 Recycling bins, if they are present at all, are turned into trash cans by covering them with a black plastic bag so the identifying yellow is hard to see, and/or by placing them unpaired with a trash can. This year, valiant attempts were made, in particular by Princeton native and Environmental Commission member Lexi Gelperin, to get Communiversity to integrate recycling into its operations, but results were mixed. Students ended up playing the role of "Roaving Recyclers", picking bottles and cans out of trash cans. 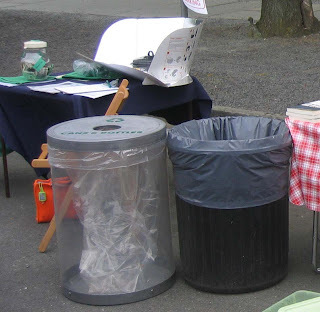 At the Princeton Environmental Commission table, we demonstrated the simple pairing of a recycling bin and a trash can. The recycling bin has a narrow top, well-marked, with a transparent body so the bottles/cans inside provide an additional visual cue that it's for recyclables only. When will we start seeing such pairings at public events in Princeton? Having come of professional age back in the 1960s and 70s, Dr. Socolow now feels a strong sense of deja vu. The issues we are grappling with now, especially energy consumption and its impact on the planet, were being discussed back in the 1970s. (For my part, I took a course at the U. of Michigan in the late 70s called "Low Energy Living") What happened next, with Reagan's ascendence in the 1980s, was a shooting of the messenger. In the process, three decades have been essentially lost, and the problems we face have only grown deeper. Interestingly, Dr. Socolow pointed out that those of us who had come to hear his talk appeared to be evenly divided between two generations--those coming of age now, and those who came of age in the 70s. To begin, Dr. Socolow gave an accounting of where we stand. There are now 3000 billion tons of CO2 in the atmosphere. Air trapped in ancient ice suggests that in the 400,000 or so years before the industrial revolution, the earth's atmospheric CO2 oscillated between 1500 and 2200 billion tons. Since atmospheric measurements began in earnest in 1958, atmospheric CO2 has risen from 2500 billion tons to the current 3000. These 50 years of measurements were made by atmospheric scientists based on Mauna Loa in Hawaii, a location believed to be sufficiently removed from the industrialized world to allow for accurate data. At the ceremony marking the 50th year, Dr. Socolow said "Never has the work of so few led to so much being asked of so many." The so few were the scientists who revealed the dramatic and unprecedented rise of CO2 in the 20th century. The so many are the rest of us on earth being asked to change our ways. And how much do we need to change our ways to avoid the worst consequences of climate change? Whereas the burning of fossil fuels spewed 6 billion tons into the atmosphere in 1950, that figure is now 30 billion every year. 15 of those go into the atmosphere; eight are absorbed by the oceans (apparently with disastrous consequences for marine life), and the remaining 7 are somehow absorbed by the land biosphere. or use 300 kilowatt hours of electricity per month from a coal burning power plant, or 600 kilowatt hours of electricity per month generated by a natural gas plant. And then there's your workplace. If you're associated with the university, your share of the university's energy use is 13 tons per year. So, you see we're way over our individual allotments. Environmental values must co-habitate with others deeply held--democratic values, consumer values, and values of self-realization--that, for instance, slow our response to crisis, create an appetite for stuff, and cause us to burn energy as we travel to see the world. But Dr. Socolow still sees reasons for optimism. The world is terribly inefficient with its energy use. Carbon emissions have just begun to be priced--already in Europe, and in less than a year utilities in NJ. If one goal is for humanity to actually start reducing its overall use of energy 50 years hence, it helps that most of the 2058 physical plant has not yet been built. One of his main points is that solutions are not innocuous. Conservation can lead to regimentation. Renewable energy can compete with other uses for land. Nuclear power generates fuel that can be used in nuclear warfare. "Clean coal" has impacts on miners and land. As often happens when you're trying to change the world, you find that the english language lacks current words to carry new concepts. Dr. Socolow proposes a new word for a new intellectual domain. Over the past 50 years, we've delved deeply into the history of the universe, the earth and of life itself. Can we achieve a comparable quantitative understanding of what human civilization will look like at various times in the future? This new discipline would be called prospicience--a combining of the words propect and science. In contrast to Amory Lovins' talk, which seemed to imply that we can stop global warming without financial or personal hardship, Dr. Socolow sees solutions as possible but hard. He looks to the past to find comparable situations in which "What once seemed too hard has become what simply must be done." For precedents, he points to the abolition of child labor, the addressing of the needs of the disabled, and the mitigation of air pollution. I'd suggest that the abolition of slavery is the most relevant precedent, since both slaves and fossil fuels have played the role of providing energy on demand. Only slowly do the beneficiaries of that energy explore the ethical implications of the comfort and convenience it brings. One of the questions raised after the talk was why Mr. Socolow did not mention population as a factor. He acknowledged that population is a central aspect of climate change, and said that the severing of population from the discussion of energy had happened in the 1980s, and coincided with the shooting of the messenger. Amory Lovins--Will the Future Ever Come? Amory Lovins, founder of the Rocky Mountain Institute, lives on another planet, and has spent his life encouraging us to join him. It's a much more sensible planet, where most of the intimidating problems we earthlings are struggling with--climate change, energy independence--have long since been solved. His embassy on planet earth is located 7000 feet up in the frequently frigid Rocky Mountains, where he lives comfortably and grows bananas year after year in a house so sensibly and cleverly designed it doesn't need a furnace. Inbetween banana harvests, he comes down from the mountain to point out sensible ways for humanity to avoid destroying the planet. When it comes to steering civilization and the planet clear of the looming danger of climate change, Mr. Lovins believes we have been offered a false choice. Do we want to die from climate change, oil wars, or nuclear holocaust? To avoid these unsavory options, he points to a future that is dependent neither on oil nor nuclear energy. This better future is driven largely by negawatts, and the magical sources of this magical energy is efficiency. If you find a way to avoid burning a barrel of oil, it's the same as having produced a barrel of energy in your own backyard. Does everyone wish for energy independence? Well, there's a Saudi Arabia-sized deposit of negabarrels easily within our reach, on our home turf, right under Detroit in a rich, efficiency-laden deposit he calls the "Detroit Formation". To access all this energy, we must first drill through thick layers of false assumptions, beginning with the assumption that climate protection is costly. On the contrary, Mr. Lovins points out that smart companies are racing for the profits to be had by becoming more efficient. DuPont, for instance, now uses 80% less energy than it did in 1990. BP increased its profits by $2 billion through efficiency improvements. IBM, ST Microelectronics, Dow, GE, Texas Instruments--all these and many others have jumped on the efficiency train in a big way, and have made money in the process. The motherlode of negabarrels awaiting exploitation in Detroit has to do with the gross inefficiencies of the automobile. Only 0.3% of the energy used by a car actually moves the driver, whose weight is a mere pittance compared to the massive metal hulk of metal and rubber we must drag around with us on errands. "Lightweighting" is the future, which has much to do with replacing automobiles' heavy metal frames with carbon materials that are both lightweight and strong. To demonstrate the safety of lightweight car frames, he showed a spectacular crash by a race car made of carbon, from which the driver walked away unscathed. The higher cost of the frame will be offset by the savings in the much smaller engine needed to propel it. Mr. Lovins believes the technology for radical reductions in energy use is at hand, and pointed out that, with government intervention, it took only six months for car factories to switch over to making tanks and bombers back in World War II. Conversion this time, to much more efficient cars, will be much easier, since carbon frames for cars can be made with far less equipment and robotics than metal chassis. Though he mentioned government intervention in World War II, Mr. Lovins' philosophy is based primarily on getting government to step out of the way. He pointed to perverse incentives in 48 states that reward power companies for selling more electricity. "Let all ways to save or produce energy compete fairly," he says. "Our current energy policy is the biggest threat to our achieving rational energy security." Another notherlode of negawatts can be found in the gross inefficiency of our electrical power distribution. According to my notes from the talk, for every 100 units of energy consumed by power plants, only 10 units actually get utilized by consumers. That would suggest that the desktop computer I'm using to write this post, which uses 150 watts of electricity, is actually producing 1500 watts worth of CO2 at the power plant. If I were using a more efficient computer, say, my old desktop, which used only 35 watts, I would in fact be reducing my carbon footprint by 1150 watts. And therein lies the tremendous frustration I felt after Mr. Lovins' wonderfully hopeful presentation. Though his facts and figures were compelling, his words and ideas didn't magically replace the wasteful incandescent bulbs that still light that charming lecture hall at McCosh 50. We all stepped out into the night to return to homes and offices equiped with energy guzzling furnaces and air conditioners. The local auto showroom offers no deals on cars made of lightweight carbon. In fact, the world, our world, seems to be drifting ever farther from the desired orbit. My newer computer, which I naturally assumed would be more efficient than the old behemoth it replaced, turns out to use four times more energy. The auto dealership parking lot is lined with 17 mpg minivans and SUVs, and the electronics outlet is packed with big-screen TVs. Solar panels remain too costly to install without big subsidies. For decades, we've heard these teaser stories on the news about one scientist or another doing promising research on new technologies, alternative energy sources that show great potential but aren't quite ready for the market. And yet here we are, still driving dinosaurs and paying ever more to heat and cool our leaky caves. The artist's rendition of streamlined trucks that Amory Lovins showed us looked eerily like the futuristic vehicles I saw in magazines in the 1960s. The future stubbornly remains an appealing drawing on a piece of paper, a mirage that keeps us trudging through the desert, a brilliant 21st century lecture deluminated and belied by 19th century light bulbs.